The grounds of Hale Ho'okipa Inn Bed and Breakfast are a feast of organic fruits, dazzling flowers, and majestic old trees. In a tropical climate with cool winters, something is always blooming or in fruit. 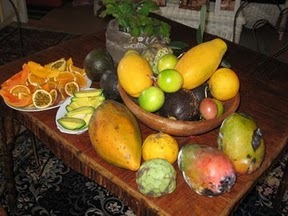 Winter season offers butter avocados the size of small volleyballs, and Cherimoya, locally known as custard apple. Cherimoya is a delicious sweet and creamy fruit. Other winter fruits, are lilikoi, passion fruit, and the mouth puckering Surinam Cherry. Summer fruits need more warmth to ripen. Two varieties of papaya grow here, the Solo Papaya, more orange in color, and the pink Sunset Papaya with a sweeter flavor. Apple bananas, an island favorite, are abundant towards the end of summer producing large stocks loaded with delicious fruit. We have three different varieties of bananas growing, the crowd pleaser is definitely the Apple Banana because of the unusual apple flavor to the fruit. Citrus are abundant in the summer as well. 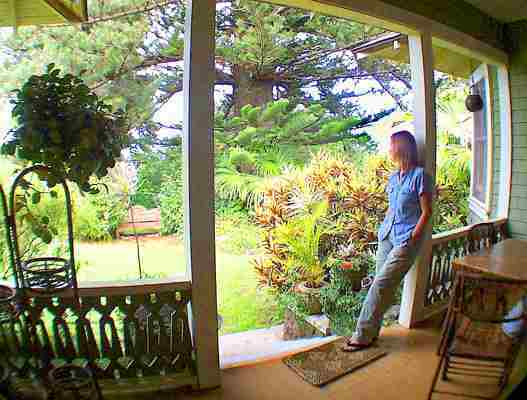 The property is dominated by one of the largest most magnificent Norfolk Pine trees in the State of Hawaii. Planted in perhaps the late 1800’s this heritage tree measures close to 20 ft around the base and towers over 100 ft high.